The President’s Task Force on Environmental Health Risks and Safety Risks to Children is the focal point for coordinating federal government efforts to explore, understand, and act together to improve children’s environmental health. The Task Force works to address preventable environmental factors that lead to differences in the burden of asthma for poor and minority children relative to their peers. 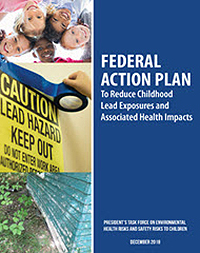 The Task Force coordinates interagency efforts to better understand and prevent disease and disabilities in children from lead, including development of a new federal lead strategy. Understanding and predicting disease and disabilities in children across their life stages that result from exposures to chemicals and metals, including pesticides, manufacturing ingredients, lead, and others, is a focus of the Task Force. The Task Force seeks to identify key strategies to understand and address climate change impacts on children’s health and to inform federal agencies and others engaged in climate change mitigation, adaptation, and response. Healthy settings (such as homes, schools, and daycares) have eight primary qualities: dry, clean, pest-free, safe, contaminant-free, well ventilated, well maintained, and thermally controlled. The Task Force works to ensure healthy settings for all children.